America’s National Anthem isn’t an easy song to sing. It’s got some really difficult notes to hit well, and it’s just kind of a weird little song. However, it is the National Anthem, so it’s not like we can replace it with one of the many other, possibly better songs written about the United States of America, no matter how much we might want to. 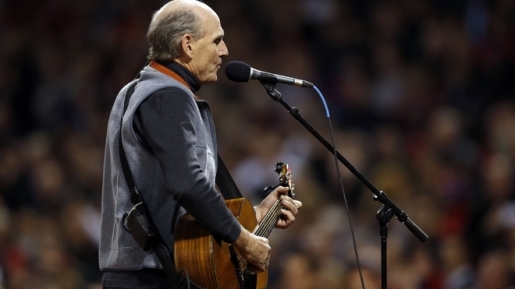 Folk legend James Taylor, a member of the Rock and Roll Hall of Fame class of 2000, got the chance to lead into America’s national game with America’s national song in front of game two of the World Series at Boston’s historic Fenway Park. He steps up to the mic, gets his guitar ready, and… promptly screws up. James Taylor started singing “America The Beautiful” rather than the National Anthem at last night’s World Series game. Of course, just because he’s James Taylor, that doesn’t mean he’s immune to nerves. Christina Aguilera screwed up the National Anthem at the Super Bowl, and we’ve all forgiven her (or forgotten about it, same thing). I’d imagine on a national stage, in front of tens of thousands of people, with the world watching… yeah, I’d probably wet my pants and fall over crying, rather than simply try to mash up two of America’s favorite pro-America songs.